Today I finished my first warm/cool palette still life. I have been working on this since mid January, though not exclusively, and I’m ready for it to leave the nest. You may have noticed based on the poster studies of master works I did back in September that I am a huge William Nicholson fan. Still life paintings get a bad wrap for being boring or for being, true to their name, lifeless. When I realized I’d be spending a lot of this and next year working on still lifes I got really interested in Nicholson’s ability to create atmosphere and personality in his own works. They are often spare but the compositions of his objects have the look of being found rather than arranged. 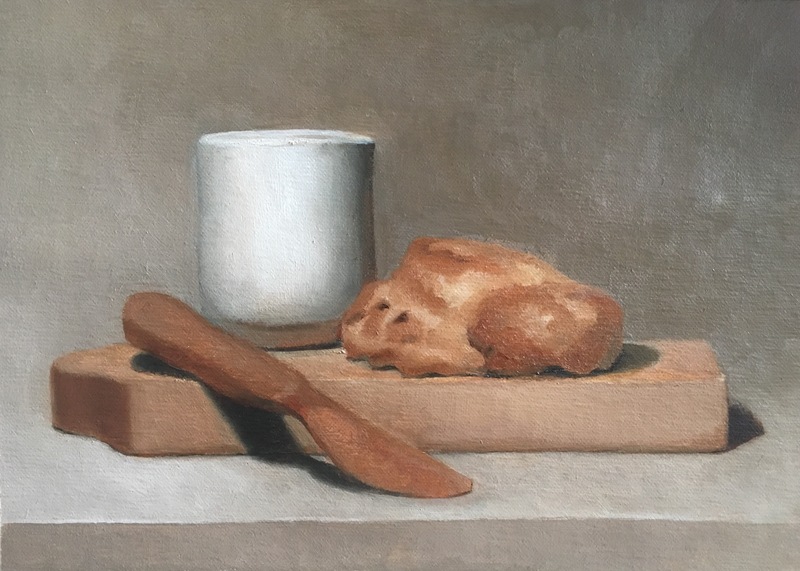 As an homage to Nicholson’s bread and biscuit still life which I adore, I set up a scone and a handmade clay cup on a cutting board with a wooden butter knife tipping down in front. Here’s the process I went through to get to today: I started by making a small 5×7″ sketch of the set up and began painting it with the burnt sienna and ultramarine palette you see below. You’ve seen the finished study as the featured image on the last post. Juliette realized that I needed to add yellow ocher to be able to capture the subtle warmth of the scone and the cutting board. Then I made a larger more detailed drawing of the set up and transferred it to a 10×14″ canvas. I covered the drawing with burnt umber and made my wipe out underpainting. I painted the background first because I knew I wanted a light background but not so light that the scone and the cup wouldn’t appear luminous by comparison. Here you can see the scone was the last thing painted on the first pass. All in all, each object including the background got three or four passes correcting things like value, drawing or simply turning form more smoothly. Then a week ago I could see the end in sight when something frightening happened. I put my palette on my chair and left the room. As I exited something fell off the wall, hit my easel and tossed my painting jelly side down onto my palette. Luckily I had just rubbed linseed oil on the painting to brighten the colors. The slick surface made clean up easier but it felt like defusing a bomb. I had no idea if I would be able to save it. I had worked on the cup for about two hours that afternoon so it was freshly painted and all my work wiped right off but the paint globs elsewhere were cleaned off and those spots were touched up within an hour. I was sweating but I think my classmates were even more traumatized than I was. They watched me clean with bated breath. Accidents like this can be good for keeping things in perspective. Everything is fixable. And a week later here we are. Tomorrow I will start painting a cast. If you remember the cast drawing of Caesar from last year you’re thinking, wow, another super arduous cast project. And you’re right! But this is the last one I will do as a student. Tonight I set up a beautiful cast called “Bathing Venus.” The original is in the Lourve. Guess I’ll have to go visit her. My daughter in law Soyoung shared your website with me today, and it’s marvelous start to my day. Your process is insightful and I look forward to meeting you in person thru Max. I’m going to share this with artist friends. Welcome Debb, I’m so glad Soyoung shared this with you. We’re grateful to have her and Max in Seattle with us. I hope to meet you in person as well. I post about once a month so checking back might not be as convenient as signing up for email alerts, just in case youre you’re interested. 1. Click the “Follow” tab at the bottom right of the screen. 2. When the tab opens, just type in your email and click “sign me up.” Cheers!